Nieuws 22/02/14 | De Rebellenclub! De Rebellencub! 22 februari 20:00 @ de Vondelbunker! De Rebellenclub is a new recurring event at the Vondelbunker that explores the validity of the conviction that there can be no art without a cause. That art can be more then a passive mirror of the ego or the society it derives from. That art is a powerful way to express, manifest or claim a cause, both personal and activist. 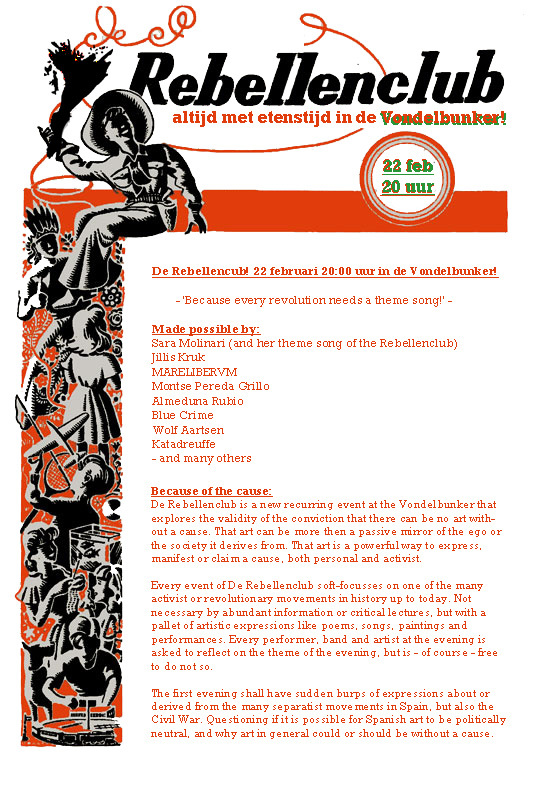 Every event of De Rebellenclub soft-focusses on one of the many activist or revolutionary movements in history up to today. Not necessary by abundant information or critical lectures, but with a pallet of artistic expressions like poems, songs, paintings and performances. Every performer, band and artist at the evening is asked to reflect on the theme of the evening, but is – of course – free to do not so.